If we’d be able to remember everything that happens to us and around us, we’d probably go crazy. Our brain has a self-defense mechanism that selects what we’re able to remember, and lets go to what’s not necessary. How exactly are our brains wired to remember certain things? What makes some stories more memorable than others? And why being right isn’t the same thing as being remembered? There’s no universal answer to that, but there are some common characteristics – and this is what we debated in this podcast episode, after reading “Made to Stick: Why Some Ideas Survive and Others Die” for our book-club. Released more than 10 years ago, this is the first book written by the brothers Chip and Dan Heath. It became one of the most recommended book by entrepreneurs across various fields, was named the Best Business Book of the Year and spent two years on the Business Week bestseller list, and it was also an Amazon Top 10 Business Book for both editors and readers. Chip Heath is a professor at Stanford Graduate School of Business, where he teaches courses of business and organizations. Dan Heath is a Senior Fellow at Duke University’s CASE center, which supports social entrepreneurs. He’s the founder of the Change Academy, a program designed to boost the impact of social sector leaders. Prior to this, Dan worked as a researcher and case writer for Harvard Business School. 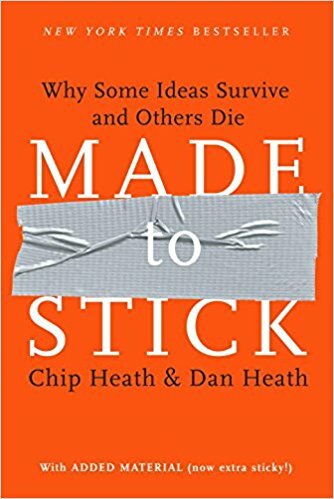 In “Made to Stick”, the brothers Heath outline the formula that can help make an idea sticky, while exposing us to psychology notions and the process of human thinking. This is the type of book that you should read if you want to improve the way you communicate – the ideas from it can be applied to almost any domain we can think of. It can prove to be helpful to future marketers (especially copywriters), journalists, and also early-stage entrepreneurs who want to improve the way they communicate – no matter if it’s for improving public speaking skills, posting on social media, or increasing authority. But enough with the spoilers already. If you want to learn more, you can listen to us debate the ideas in it. Food for thought: what would happen if everyone would read and apply the principles outlined in “Made to Stick”? Leave us a comment below, tell us what you think. P.S. for our next book-club talk we’ll read: Nassim Nicholas Taleb – Black Swan (due mid-May, 2018).